Born on 17 January 1894 in Louise, Ontario - son of Mrs. J.S. Wilson, Hanover, Ontario - at the time of his enlistment in 1916: present address in Hanover, Ontario; trade as student; Presbyterian; currently a member of the 31st Regiment; previously served with the 2nd Regiment, Queen's Own Rifles (two years as a private, six months as a corporal). 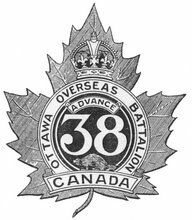 Joined the 147th Battalion, CEF, as a lieutenant in Owen Sound, Ontario, on 12 February or 14 March 1916 - taken on the strength of the 38th Battalion, CEF, on 27 December 1916 - wounded on 27 March 1918 - accidentally injured and invalided to England on 13 July 1918 - rejoined the 38th Battalion on 1 October 1918 - struck off the strength of the 38th Battalion on 21 June 1919. Died in Toronto, Ontario, in 1966.